One thing I maybe should have mentioned is that I love doing mud runs! Do you see why beating my 5k time will be such a challenge?! You can’t really get a pb when you’re knee deep in mud! 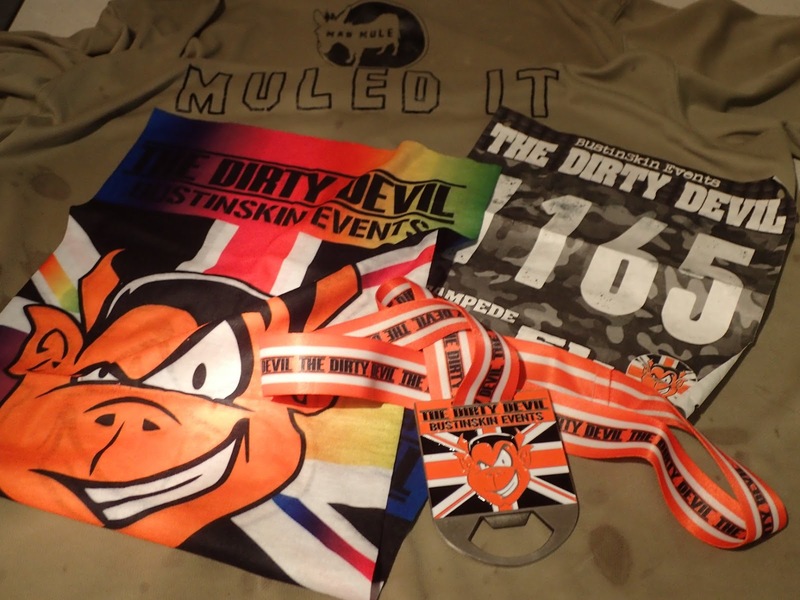 As you may have guessed from that intro, Dirty Devil Stampede is a mud run! You can do 1, 2 or 3 “5km” laps (it was actually 4.4km but oh well!) around the tank training ground at Bovington Camp so the route is sandy, gritty, hilly and wet! I loved this little write up on the website “If you have an allergy to mud, fun, can’t get a scrape or two without a visit to A&E don’t like the cold, hills or laughter then I think you may not want to attend”!!! On the morning of the run it was raining cats and dogs (and I think even the odd mouse too!) But to be honest, once you're running that doesn't really matter too much as you're were going to get wet and muddy anyway! We got there nice and early as you can end up parked miles away – which isn’t ideal when you finish and you’re wet and cold. So we grabbed a cuppa as our “warm up” and hid in the car waiting for the start. I was running with a friend so we plodded along chatting and embracing the mud! I did have to giggle at the people trying to go around the puddles – bearing in mind at the first corner you had to go through knee/thigh high water so were already wet! Did we get lapped by the front runners for the 10k? Yes - but for the first time I actually judged the guys running fast! They weren't stopped to embrace the mud and have a laugh! Also, one them barged past me on a narrow, slippy bit of path so maybe that's why I'm anti fast runners! I promise we didn't intentionally dress the same! In my opinion, this is very much a fun run and I loved all the people in fancy dress – including the bunch of grannies (zimmer frames and all!) Part of what added to this previously was the random inflatables in the “puddles”! Unfortunately by the time we got to the “Shark Tank”, everyone had already stolen all the sharks – not that I wanted one but it would have made for a good pic! I can’t lie; it was nice to peel off to the finish after one lap, as it was tough under foot as its either soft and sandy ground or boggy and muddy - plus the water was absolutely freezing (well, it is January)! You got some nice goodies at the end too – medal, buff and water bottle (although my water bottle ended up just pouring water in my lap the first time I went to use it!) As you will no doubt find out in later posts, I get very upset if I don't get a medal! Overall, a very fun and well organised run! I’ll finish with a little tip that I learnt the hard way - cargo nets and pony tails don’t mix! If anyone else did the Dirty Devil Stampede, I'd love to hear your thoughts so leave me a comment below!